South Koreans will elect their new leader today, in what could mark a grand finale to eight months of political turmoil that saw sitting President Park Geun-hye ousted by a peaceful grassroots rebellion. It is a crucial vote that will decide the direction of the country over the next five years, amid the global and regional crosscurrents surrounding the Korean Peninsula. A liberal is the favorite to win, but there is the specter of a Trump phenomenon. Will Moon Jae-in take the presidency as polls suggest? Or will Hong Joon-pyo -- with all his unconventional and divisive rhetoric -- eke out an upset victory on “shy-Hong” votes? The following is a real-time running update on Election Day, how it unfolds and who emerges as the winner. 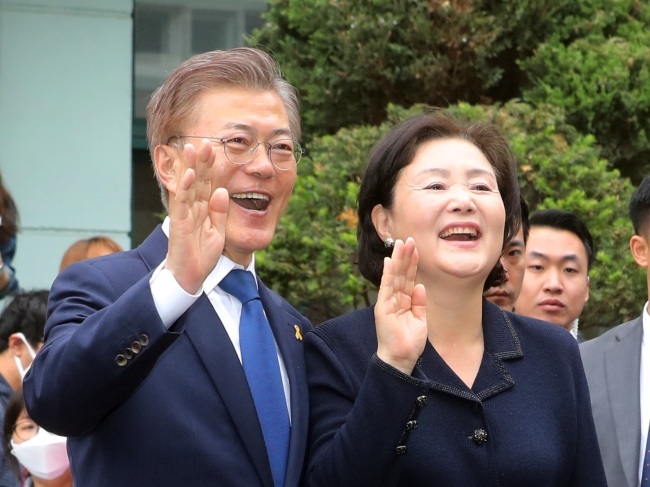 The National Election Commission announced Wednesday that Moon Jae-in of the liberal Democratic Party is South Korea’s new president, after it completed ballot counting at around 7 a.m.
His five-year term began immediately after the election watchdog confirmed his victory during a general meeting at 8 a.m. The NEC said Moon won 13.42 million, or 41.08 percent, of all votes in the presidential election held Tuesday. Hong Joon-pyo of the conservative Liberty Korea Party came in second with 7.85 million votes (24.03 percent), followed by the center-left People’s Party’s Ahn Cheol-soo with 6.99 million votes (21.41 percent). Yoo Seong-min of the Bareun Party and Sim Sang-jeung of the Justice Party failed to secure a double-digit percentage of votes, with 2.22 million (6.76 percent) and 2.01 million (6.17 percent), respectively. The gap between the number of votes clinched by Moon and runner-up Hong Joon-pyo was over 5.57 million votes -- the widest gap for all presidential elections here. Out of a total of 32.67 million votes, 135,733 votes were invalid, while another 9.67 million votes were blank ballots. As Moon Jae-in -- the winner of the night -- appeared at Gwanghwamun Square in Seoul at around 11:40 p.m., thousands of his supporters erupted in cheers. Moon began his speech by thanking the people on the makeshift podium at the square. “It is a great victory by the great Korean people who have stood by me on a quest to make the country where the principle and common sense work,” he said. “I express my gratitude and consolation to my competitiors. I will join hands with them to go forward for the future. From tomorrow, I will become the president for all. I will serve and unite those who have not supported me. I will not forget your hopes and wishes. I will make the country one where justice and principle are upheld and the people win,” he said. 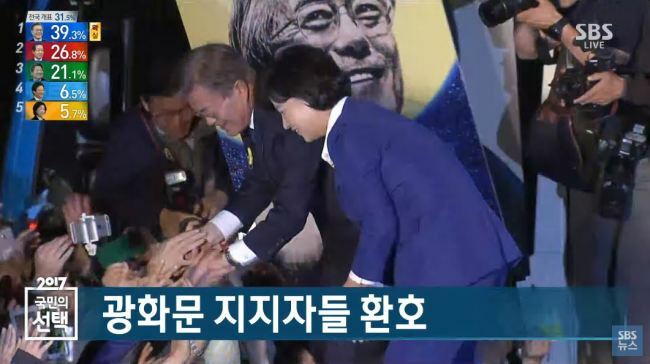 De-facto President Moon Jae-in shakes hands with supporters in Sejongno Park in Jongno-gu, Seoul. The rivals of the Democratic Party of Korea’s Moon Jae-in each held a brief press conference after exit polls were released, virtually admitting their defeat. 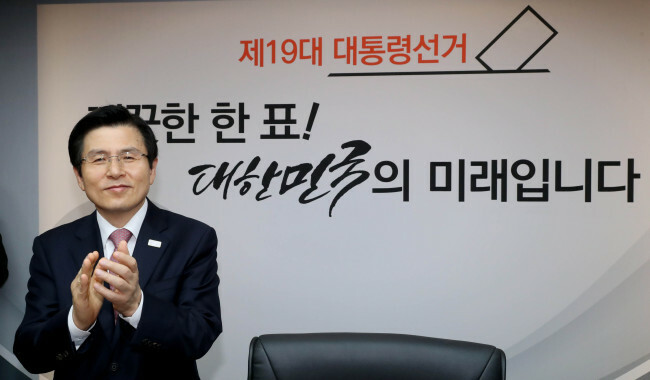 “Although we shall have to wait until the end of the vote count, if the exit polls are true, I will find solace in the fact that I have recovered the Liberty Korea Party,” Hong Joon-pyo, who was seen as coming in second, said at the party’s Yeouido office. Ahn Cheol-soo of the People’s Party also arrived at the situation room at the National Assembly at around 10:35 p.m. and briefly delivered his position. “(I) lacked to fulfill the zest for change. ... 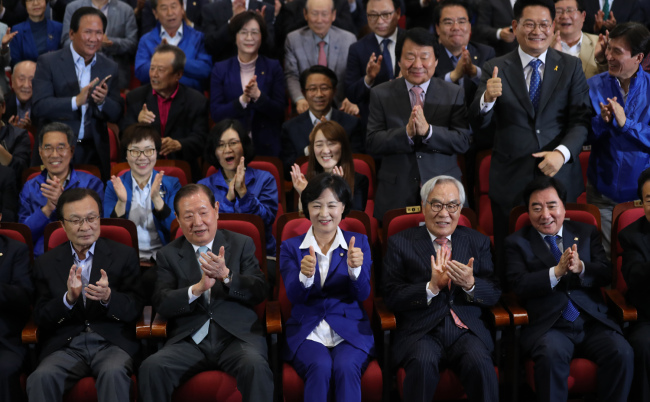 I hope that the Republic of Korea steps forward into the future with the new president,” Ahn said, also offering his appreciation to his party members and supporters. As local TV broadcasters reported a clear win for Moon to become South Korea’s next president at around 10:40, his supporters erupted in cheers while watching the news from big screens broadcasting the vote count real-time. 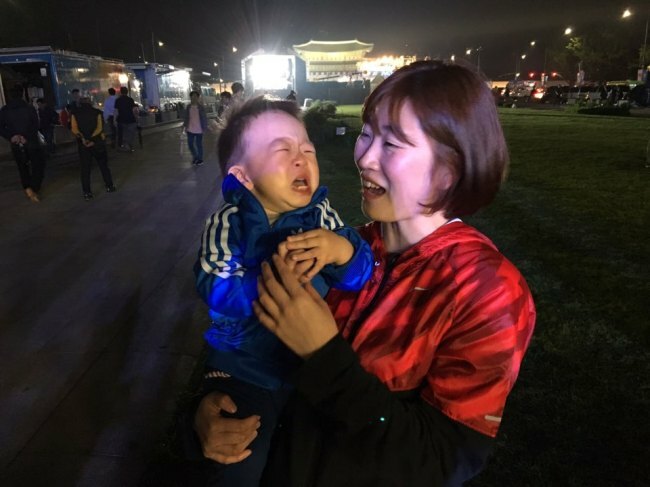 “I came to Gwanghwamun Square to celebrate Moon’s victory because I think it is really a historic moment,” said Kong Hye-seon, 33, who traveled to Seoul with her family to watch the result. Moon garnered 38 percent of support as of 10:40 p.m., with 12.2 percent of votes counted. Despite drizzle, Gwanghwamun Square was packed with hundreds of citizens who came to watch the live reporting of the exit poll results. Polls closed at 8 p.m. Many of them cheered and shouted name of Moon Jae-in, when results were annouced that Moon received 41.4 percent of votes based on the exit poll. Outdoor screens have been set up by local broadcasters SBS and JTBC for people to watch the vote count. The Democratic Party of Korea’s election headquarters inside the National Assembly in Yeouido, Seoul, erupted in joy and celebrations when exit polls were released. 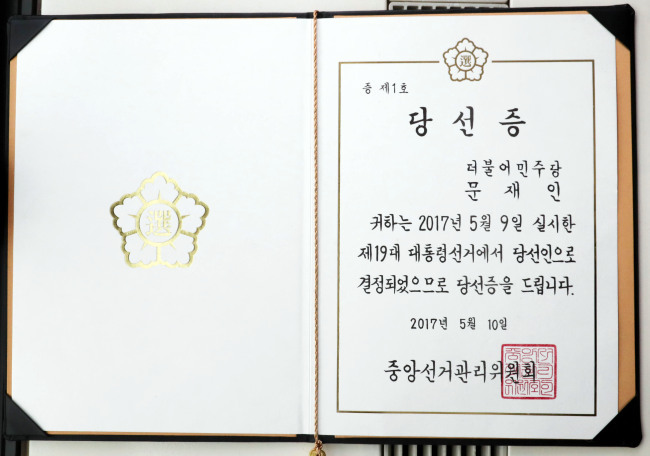 Party leaders and rank-and-file members chanted “Victory” and “Moon Jae-in” in unison. Moon, smiling, arrived at around 8:30 p.m. and delivered a speech. A few blocks from the parliamentary building, the mood in the head office of the conservative Liberty Party of Korea was subdued. Silence loomed across the chamber, sometimes broken by a sigh of disappointment. Some party officials expressed disbelief at the exit poll results indicating the liberal candidate would dominate regions that had long been considered their strongholds. Officials at the centrist People’s Party appeared shocked by the prospect that its flag-bearer Ahn Cheol-soo had slipped to third place. 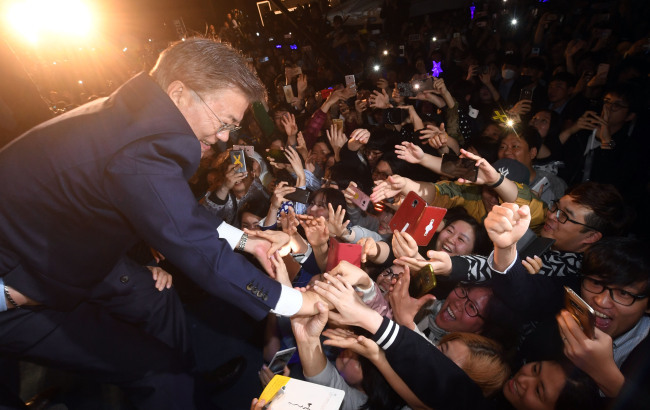 As exit polls pointed to the victory for Moon Jae-in of the liberal Democratic Party of Korea later Tuesday, his supporters erupted in cheers to usher in the new era under the country’s next president. Hundreds of his supporters gathered outside his home in western Seoul to greet him as the major TV broadcasters -- SBS, MBC and KBS -- announced the results of their exit polls at 8 p.m. 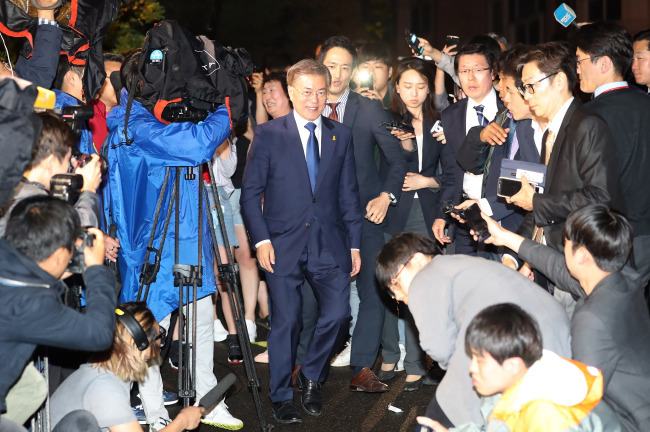 He left his residence and arrived at his party’s headquarters in western Seoul at around 8:30 p.m. to meet his supporters and party officials. Moon, a former human rights lawyer and secretary for civil affairs under the liberal Roh Moo-hyun administration, plans to wait for the final result back at his residence and head to Gwanghwamun Square in central Seoul at around midnight when his win is confirmed. The square carries a special meaning for his election campaign, as he started his campaign there, vowing to make South Korea democratically ruled by its people and root out the irregularities facing the country. It was a base for Koreans who took to the streets to demand former president Park Geun-hye’s ouster over a series of corruption scandals. Park’s removal from power brought the election forward from December to May 9. Moon Jae-in of the Democratic Party of Korea is the likely winner of the presidential election, exit poll figures showed Tuesday. The exit poll conducted by the three terrestrial broadcasters -- KBS, MBC and SBS -- indicated that Moon received 41.4 percent of the votes to win the election. Polls closed at 8 p.m. and ballot counting is yet to begin. If the figures are correct, it will mark the return of a liberal administration after just under 10 years of conservative governments. Hong Joon-pyo of the conservative Liberty Korea Party received 23.3 percent of the votes while Ahn Cheol-soo of the People’s Party took 21.8 percent. Sim Sang-jeung of the left-wing Justice Party recieved 5.9 percent of the votes, while the figure for Yoo Seong-min of the minor conservative Bareun Party came to 7.1 percent. The outcome of the election, based on the real votes, is expected to take shape around midnight. Who will be the choice of largest voter group? Tech firm Kakao is doing its bit to help voters get to the polls, marking the nation’s 13,964 voting stations with red voting stamps. With polls staying open an extra two hours this year, voters still have 100 minutes to cast their ballots. It has started to rain in Seoul, but people are still crowding Gwanghwamun Square, where large outdoor screens have been set up for people to gather to watch the vote count. 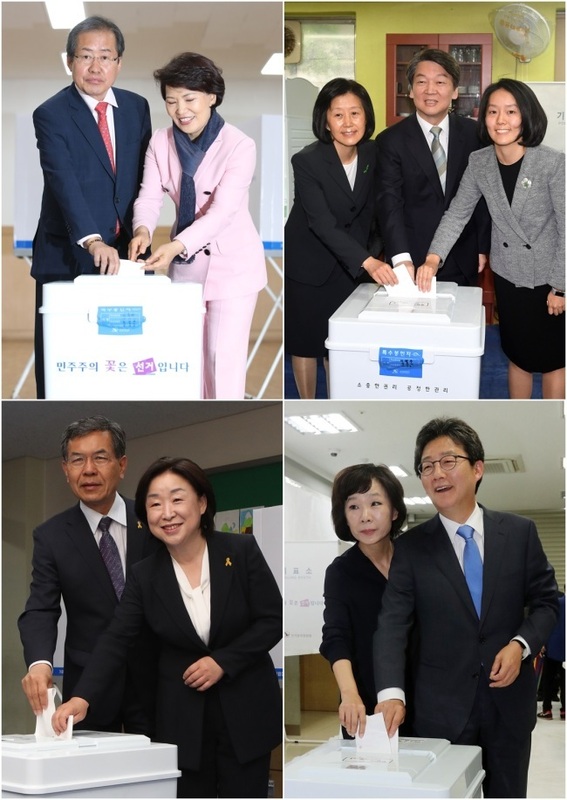 Voter turnout was more than 70 percent nationwide, as of 5 p.m.
As polling continued throughout the day, teenagers -- not yet allowed suffrage in Korea -- cast their vote in a mock presidential election run both online and in 30 polling stations across the nation, hosted by three civic organizations. Kim Hae-bin, 17, cast her vote in Gwanghwamun Square, central Seoul. “18-year-olds in Korea can get married and can drive. It is an irony that they cannot vote,” Kim told The Korea Herald. She said she has reviewed the candidates’ manifestos thoroughly and voted for the one who pledged to grant voting rights to 16-year-olds to choose their own superintendent of education. As of 3 p.m., the online turnout showed 57 percent of the 52,668 registered voters cast their ballots, according to the organizers. The outcome, including the results of spot voting is expected at night, after the voting ends at 8 p.m., it added. 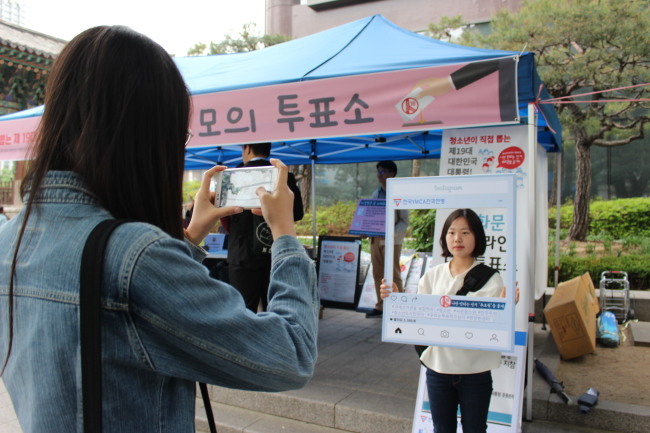 The mock election came as part of a youth movement to lower the voting age to 18, from the current 19 years by the event organizers including YMCA Korea and Korea Youth Association. 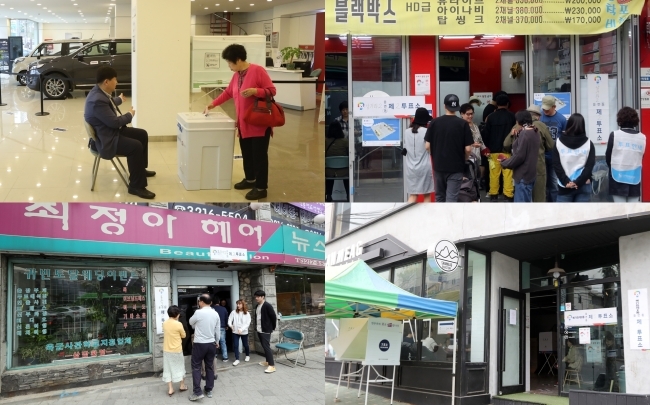 The presidential election and a hair salon may seem incongruous, but some polling venues for the 19th presidential election in South Korea on Tuesday were designated inside unlikely commercial shops in Seoul. 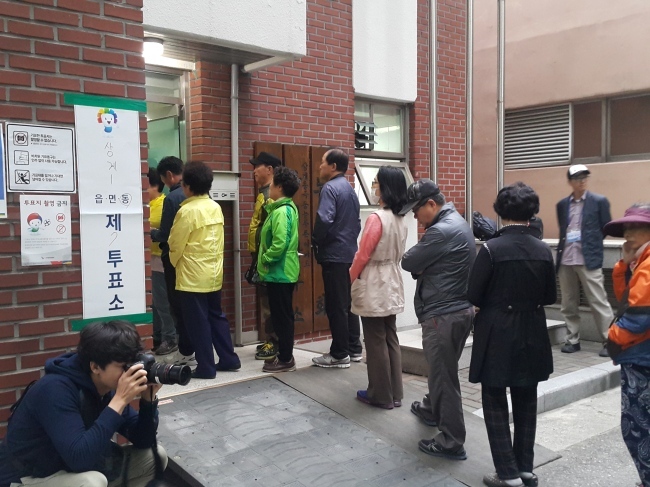 A long line of people stood outside a barber shop in Seodaemun, western Seoul, on Election Day, as the store was designated by district authorities as an official polling station. Inside the store were partitions set up to provide space for the polling booths while couches were offered for people waiting in line. 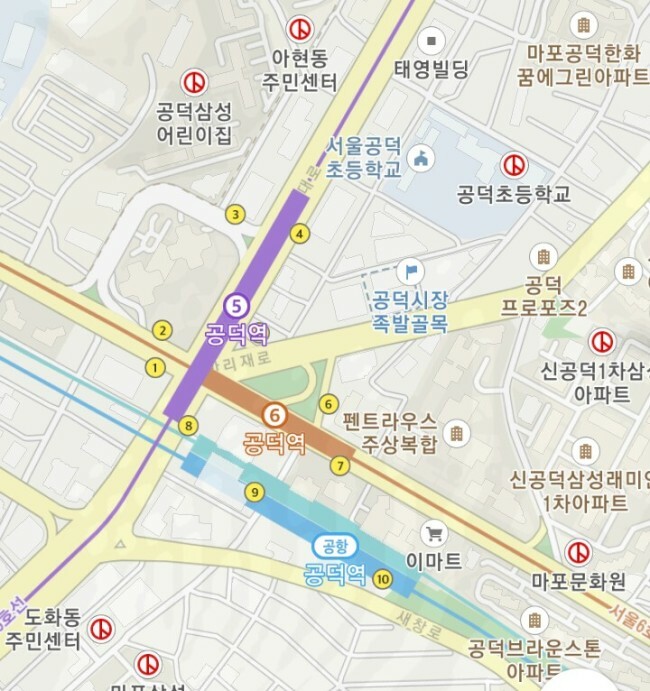 Other unlikely venues have included a vehicle window tint shop and a coffee shop in Seodaemun, a furniture showroom in Banpo-dong and an automobile dealership in Neung-dong. They are some of the 13,964 voting venues designated by the National Election Commission. The Public Official Election Act states that a public venue can be designated an official polling station to provide vicinity and convenience to voters. Korean celebrities are getting in on the voting selfie action. Actress Park Shin-hye (pictured) was among the many K-pop stars and actors taking to social media to encourage their fans to vote. See more on the story here. 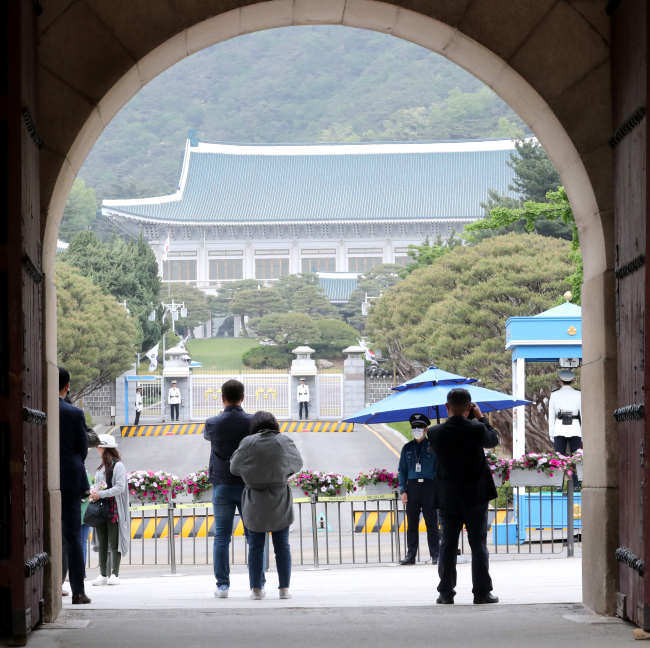 Security officials guard the main gate of the presidential residence Cheong Wa Dae on Tuesday as the nation goes to the polls to select its next occupant. 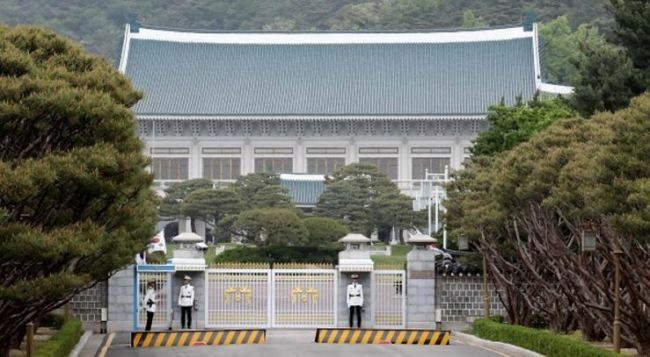 The gate has been shut since former President Park Geun-hye left the Blue House on March 12, two days after being ousted from power following a historical impeachment ruling. The nation’s new president is expected to be revealed around 2-3 a.m. Wednesday, according to the National Election Commission. More than half of South Koreans have voted in Wednesday’s presidential election, as of 2 p.m., according to the National Election Commission. Since polls opened at 6 a.m., voter turnout has hit 26.06 percent across 13,964 polling stations and the figure might reach a record 80 percent at this rate, the election watchdog said. The nearly 60 percent turnout so far represents a figure combined with last week’s two-day early voting, which stood at 26.04 percent. In the 2012 presidential election, the final turnout stood at 75.8 percent. A total of 42.48 million people, or 82 percent of South Korea’s population, are eligible to vote in the presidential election. Voting will close at 8 p.m. Moon Jae-in’s campaign headquarters in Yeouido is quiet now, starting slow for the big night. Only several party officials and journalists are around. Party leaders are expected to arrive at around 4 p.m. and the candidate -- the favorite to win -- will show up much later in the night, after the outcome becomes clear. “We have done what needs to be done. All we have to do is wait and see how things will play out,” said an official from Democratic Party of Korea. 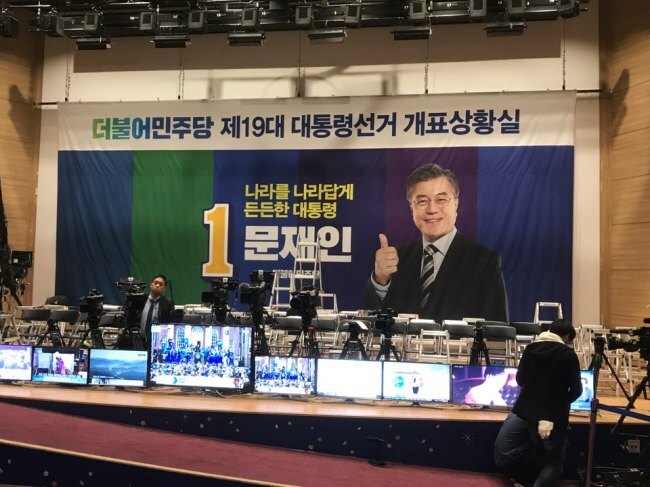 The mood in other major camps nearby -- Liberty Party of Korea and People’s Party -- is not very different, with a dozen TV screens set up to show election news in real-time. All of the three expressed confidence in their victory, although not many take their claims seriously. 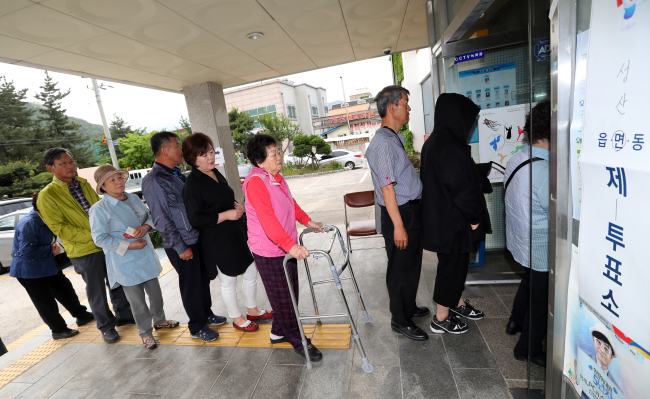 Gwangju showed the highest turnout of 61.2 percent among the eight major cities nationwide at the halfway stage of voting today, while Busan ranked last with 52.6 percent. As of 1 p.m. Sejong was ranked second with 60.8 percent, followed by Daejeon with 56.8 percent. 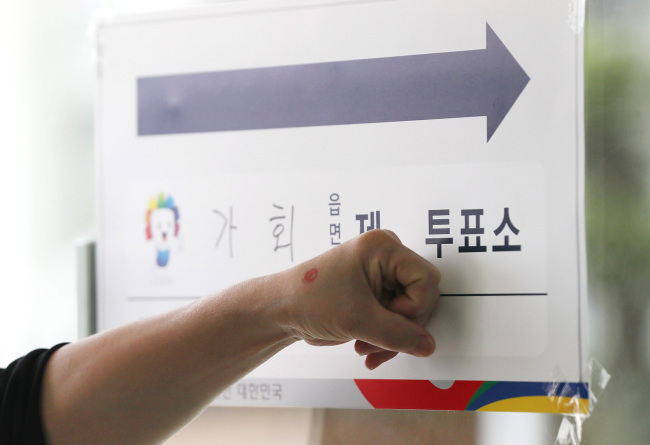 Seoul reported a 55.8 percent voter turnout, while the figures for Ulsan, Incheon and Daegu were 54.9 percent, 53.6 percent and 53.1 percent, respectively. 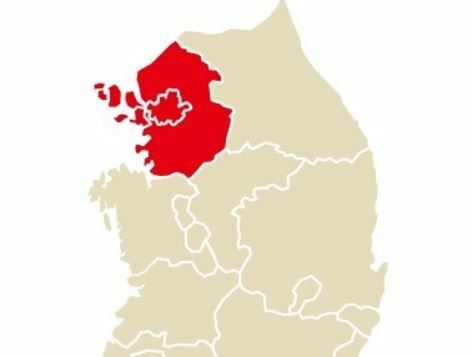 By province, North Jeolla topped the list with 61.4 percent, trailed by South Jeolla with 60.5 percent. Jeju and South Chungcheong posted the lowest and second-lowest turnout of 52.7 percent and 54 percent. The figures for the early voting, which was conducted from May 4-5, were included in interim turnout calculation. Prime Minister Hwang Kyo-ahn urged government officials to keep a keen eye on the election process, marking his last day as acting president filling in for ousted former President Park Geun-hye. “We must be prepared against all possible urgencies including blackout and communications disruption,” Hwang said during his visit at the election headquarters in Seoul Government Complex. He also demanded that the police and prosecution keep up a tight guard against election rule breaches up to the very last minute. The prime minister has been acting as president since Dec. 9 when the National Assembly passed Park‘s impeachment bill, suspending her of all presidential powers. He, too, was once deemed a plausible candidate for the conservative camp but announced in mid-March that he would not run. It looks like ballot selfies have become a hot trend. 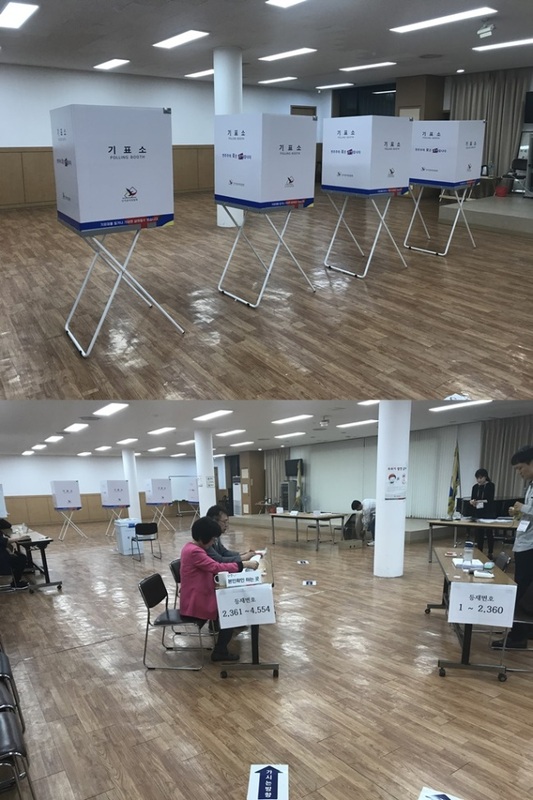 South Koreans across the country are sharing photos of themselves in front of polling booths or of their hands marked with the ballot stamp. Twitter, Facebook and Instagram have been flooded with “voting selfies” from early in the morning, as voters mark the occasion and celebrate their participation in democracy. This is the first presidential election since the National Election Commission lifted a ban on such photographs, as part of its efforts to boost turnout. 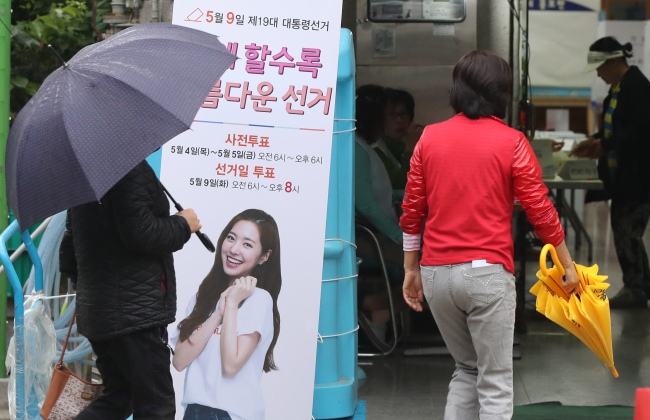 Voters are milling around the polling station in Sanggye-dong, Seoul, despite the rain. The voter turnout as of 11:00 a.m. stood at 19.4 percent, 8.4 million out of 42.5 million voters nationwide having completed their vote, according to the National Election Commission. Victims of the recent forest fire in Gangneung queue up at a local polling station to cast their vote. The voter turnout as of 9:00 a.m. stood at 9.4 percent, 4 million out of 42.5 million voters nationwide having completed their vote, according to the National Election Commission. Despite the concerns that the rainy weather may dampen the voter participation, the turnout continued to remain in a steady uptrend. The NEC anticipates that the final turnout by the end of the day, including the two-day early voting results from last week, will make it above the 80 percent mark. 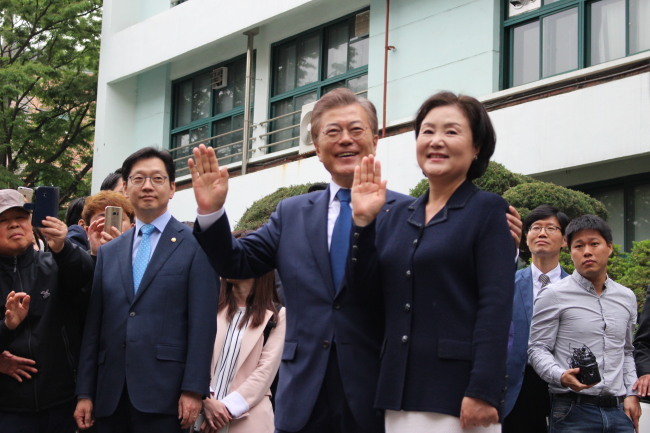 Moon Jae-in of the liberal Democratic Party of Korea cast his vote with his wife, Kim Jung-sook, in Hongeun Middle School located in Seoul's Seodaemun-gu. The scene was crowded with citizens and reporters trying to catch a glimpse of the presidential front-runner. 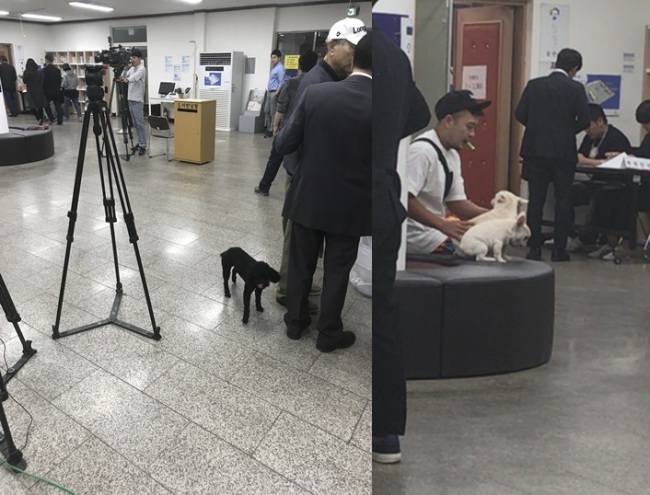 Moon will be staying home until the ballot counting starts in the evening, upon which he will keep watch of the outcome at the National Assembly. 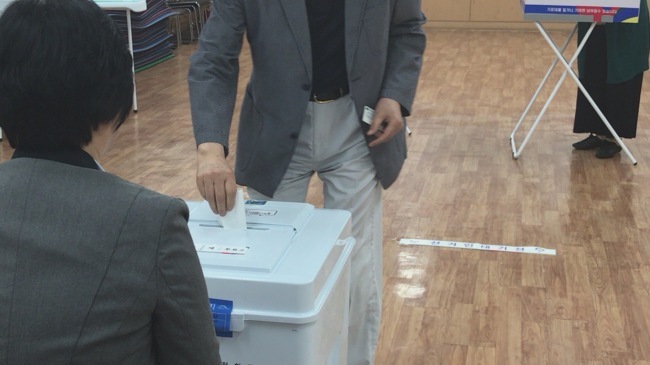 His runner-up rivals -- Hong Joon-pyo of the Liberty Korea Party, Ahn Cheol-soo of the People's Party, Yoo Seong-min of the Bareun Party and Sim Sang-jeung of the Justice Party -- all completed their vote in their respective constituency early in the day. The voter turnout as of 8:00 a.m. stood at 5.6 percent, with 2.4 million out of 42.5 million voters having completed their vote, according to the National Election Commission. South Koreans continued to flock to polling stations across the nation in the afternoon, with voter turnout reaching nearly 60 percent as of 2 p.m.
“I voted to make the country a better place for my children. I am sure my vote counts,” said Sim Eun-hee, 45, who went to a polling booth in central Seoul. “This is an election made possibly by the public. Upholding the public sentiment, I hope that society becomes fairer for all, especially for the disabled,” said Sim, who went with her physically challenged husband and two children. The voter turnout as of 7:00 a.m. stood at 2.2 percent, with 934,416 out of 42.5 million eligible voters having casted their ballot across the nation, according to the National Election Commission. The figure is down from the previous presidential election but up from last year's parliamentary vote. Over 10 million early voters, or 26.06 percent of the electorate, are not included in the tally. Here's how the ballot paper looks. 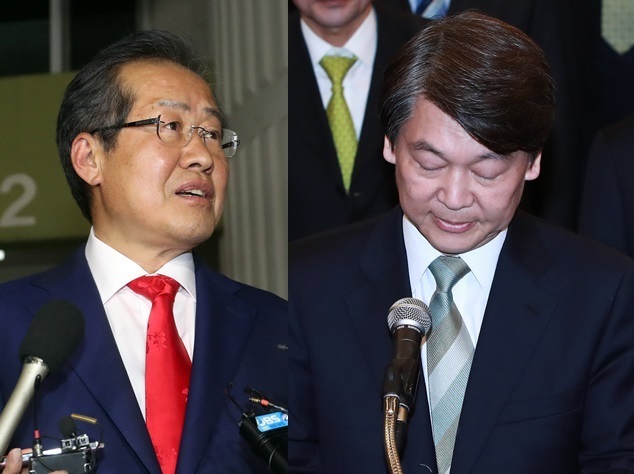 The election is marked for its crowded pack of candidates and consequently a longest ballot paper -- 28.5 centimeters -- enlisting 15 candidates, two of them resigned earlier. Just a few minutes after polls opened nationwide, people are already waiting in line at a polling station in Seoul's Sanggye district. 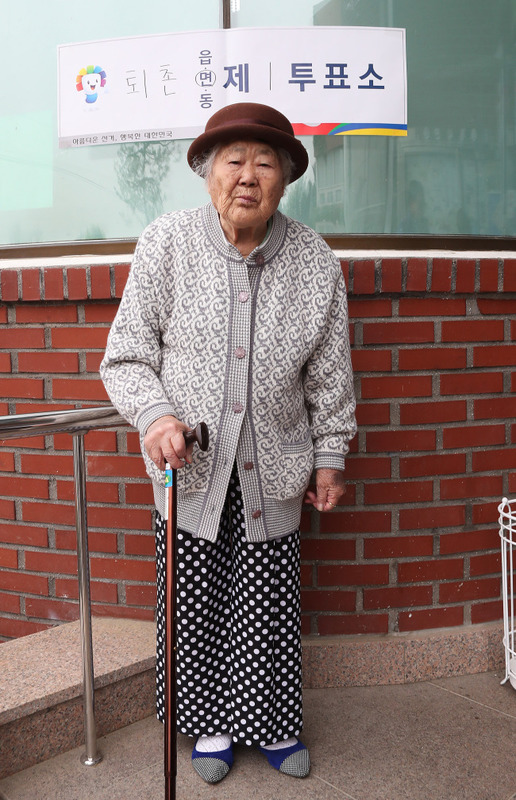 "I came to the polls early in the morning because I have plans with my family later in the evening," said Kim Jung-ja, 78. "I hope the next president will make this country a better place for the youth, such as my grandson." Election Day has arrived. Polls opened at 6 a.m. sharp at over 13,000 locations nationwide. Voting will last 14 hours till 8 p.m.
Fine dust which has prevailed upon the Korean Peninsula over the past few days continued to linger, while some rain was predicted in various parts of the nation later in the day. 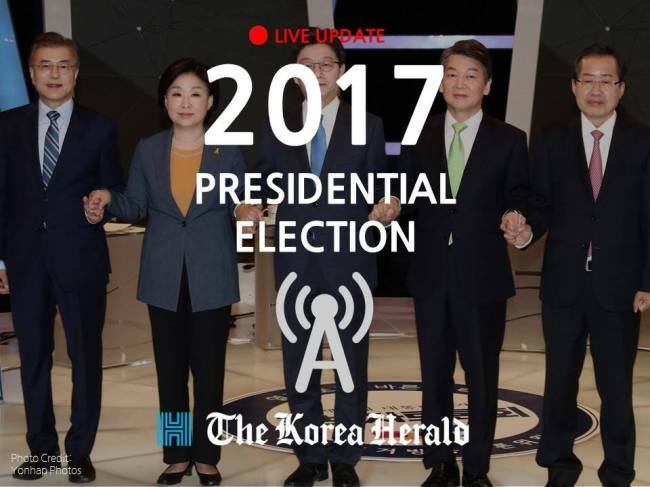 Voters have a choice among 13 candidates, although attention is on whether Moon of the Democratic Party of Korea will be able to turn his convincing lead throughout the race into an election victory. Exit polls will be released as soon as the vote closes at 8 p.m. and the outcome is expected to become clear after midnight. The National Election Commission expects the vote counting to be completed at around 6 or 7 a.m. on Wednesday.